Jammu To Pahalgam Via Patnitop, Veerinag Chashma Stay In Pahalgam Hotel. Pahalgam Local Side Seen And Proceed To Srinagar Stay In Srinagar Hotel. Srinagar Local Side Seen All Mughal Gardens, Shankaracharya Temple, Shikara Ride In Dal Lake And Stay In Srinagar. Srinagar To Gulmarg And Back Srinagar Stay In Hotel. Srinagar To Kargil Via Sonemarge Stay In Kargil Hotel. Kargil To Leh And Stay In Leh Hotel. Leh Local Side Seen Leh Palace, Shanti Stupa, Buddhist Monastery, Local Market Etc. 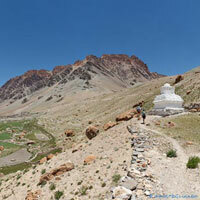 Leh To Pangong Lake (Situated On Indo-China Border) And Back Leh And Stay In Hotel. Leh To Sarchu For Night Halt In Sarchu Tented Accommodation. Sarchu To Manali Via Rohtang Pass Stay In Manali Hotel. Manali Local Side Seen Hadimba Temple, Club House, Manu Rishi Temple, Vashisht Temple (Hot Spring) Solang Valley, Buddhist Monastery, Van Vihar And Local Market & Drop Manali. Manali To Dharamshala And Stay In Dharamshala Hotel. Dharamshala Local Bhagsu Nag Temple, Water Fall, Dalai Temple, British Time Church, Dal Lake, Naddi Mountain & Sun Set Point Stay In Dharamshala Hotel. Dharamshala To Dalhousie Local And Stay In Dalhousie Hotel. Dalhousie To Khajjiar (Mini Switzer Land Of India) And Back Dalhousie Stay In Hotel. Dalhousie To Drop Pathankot, Amritsar Or Jammu.